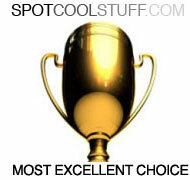 Most of the places and products reviewed on Spot Cool Stuff have something noteworthy about them that’s visible. But in the case of the Sony RX100 digital camera, the WOW factor is on the inside — the sensor. Unfortunately, the “like an SLR in your pocket” language is a bit of review hyperbole. For pure camera functionality and photo quality, you are still better off getting a top-rated SLR camera and pairing it with two or three high quality lenses. That is not to fault Sony. The laws of optics are unkind to small, pocketable cameras. 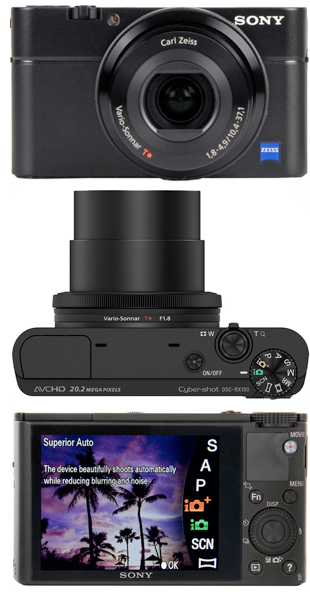 It is, in fact, remarkably impressive what Sony has accomplished in the RX100′s tiny form factor. To maximize the ability of the sensor, Sony engineers made each photosite extra large. That greatly boosts the RX100′s ability to capture detail under a wide range of light conditions. What’s especially impressive is the quality the RX100 achieves in low-light situations. The RX100 then pairs it’s high-quality sensor with one of the most capable lenses ever put into a point-and-shoot — a large-diameter f/1.8 Zeiss-branded lens with a premium “T” coating to minimize internal reflections. Sony RX100 photographers also have a full bevy of manual controls. There’s a control ring around the lens (virtually identical to the one Canon has on their competitor model, the PowerShot S110) which can be set to operate the manual focus, aperture, ISO or your choice of six other settings. Add up those attributes — the larger sensor, the fast lens and the manual controls — and you don’t quite have the equivalent of a semi-professional SLR. But you do have a rather remarkable piece of electronics and a camera that can produce results comparable to an entry-level SLR. Excellent build quality. And very responsive controls, both in terms of autofocus speed and general picture-taking. RAW capabilities. A standard ISO runs up to 6,400 and can be pushed to 25,600. Noise and image degradation are non-existent up to ISO 800. The 3-inch LCD that’s touted by Sony for its million+ pixels of resolution. Though we ourselves weren’t wowed by the clarity, we were impressed how easy to was to see the screen even in direct sunlight. Easily, the biggest drawback of the Sony RX100 is the price. At over US$640, it is pricey for a point-and-shoot. For that budget you could get, say, a Nikon D3100 or D3200 with a kit lens and have some money left over to put towards another lens. But then a Nikon D3200 isn’t able to fit in your pocket. The lens is a 28-100mm equivalent. Though we love the 28mm wide angle (especially at the speedy f/1.8), the 100mm telephoto works out to an underwhelming 3.6x optical zoom. The RX100 doesn’t ship with a bundled battery charging cradle. So there’s no using one battery while charging another. However, the battery charges via a Micro USB cord — convenient if you also carry a Micro USB to charge your phone or eBook reader. Some of the fills of other point-and-shoots, like GPS or geocoding capabilities, are not options on the RX100. With the increasing quality of cameras embedded into smartphones, some technology trend watchers are speculating that the days of the humble point-and-shoot camera are numbered. The RX100 — together with Canon’s new S110 and S100 models — show that the camera companies, at least, believe that there’s still a strong market for point-and-shoots that aren’t so humble. And the RX100 is certainly high-end. The decision to purchase one or not really comes down to cost. While the quality of the photos produced by the RX100 exceeds other point-and-shoot cameras, so does its price. As already noted, the RX100 is not a substitute for a semi-professional SLR. But we can see plenty of photographers for whom an RX100 would be ideal. At a photography conference Spot Cool Stuff attended, one of the speakers claimed that nearly 70% of people who purchase an entry-level SLR (a Canon EOS Rebel T3i, for instance) never use it with a lens other than the one that comes in the basic kit. Those people would be better off purchasing a much more portable Sony RX100 instead. For a photography enthusiast who wants to approximate SLR-like results in a pocket-sized point-and-shoot, the RX100 is perfect. So too would it be for an upper income consumer who has no interest in learning the intricacies of an SLR. 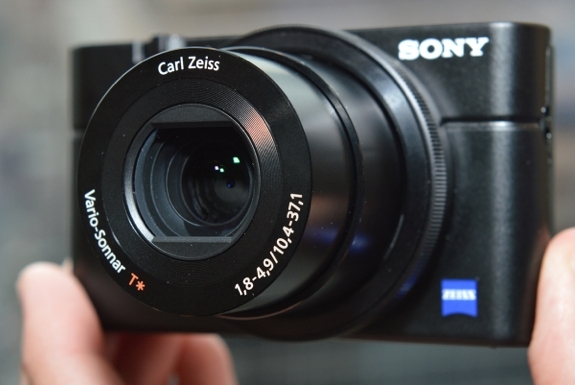 In short, if you can afford Sony RX100, we’d suggest it. It is simply the best point-and-shoot out on the market. Or, at least it will be until Sony one-ups themselves with the $2,800 RX1 in December. i’ve had my trusty panasonic lumix lx3 for a long time and have resisted getting a new camera. in its heydey, the lx3 was THE high-end camera, but i have to admit, sadly, that i’ve pushed it as far as it can go and the features of the new models out now are light-years ahead. i’m really liking this RX100. the sample photos look great and i’m not really keen on getting a bulky DSLR… thanks for this great review! I’ve just been using my iPhone to take pictures for the last couple of years but I’m getting tired of it. It’s clunky to use, the zoom is horrible, and the pictures aren’t quite as good as with a dedicated camera. The only reason I haven’t changed is because cameras are too big for me to carry around. This one looks awesome though and I might have to check it out. Thanks for the great article! I have zero use for a DSLR. I will never walk around with a giant camera. Hell, I’ll rarely walk around with anything that doesn’t fit in my pocket, and even then it’s just an airplane carry-on, which a DSLR still can’t fit into. So I am not and never will be a DSLR customer. That makes me the exact target of this product.